With a time-honored history, Guangzhou snacks have remained in great demand for a long time. The snacks mainly fall into seven parts: fried refreshments, various kinds of porridge, noodles made of rice or wheat flour, cakes made of wheat or glutinous rice flour, sweet food, Zongzi (a pyramid-shaped dumpling made of glutinous rice wrapped in bamboo or reed leaves) and snacks made with grains other than wheat and rice. They are served all the year round. In winter when eating various kinds of refreshments, people would take a bowl of porridge. Snack stalls can be found all over Guangzhou, especially in the five food streets, i.e., Xihao Ermalu, Guangda Lu, Qingping Lu, Guigang and Hongde Lu. River snails have thin shells and thick meat. Frying river snails and purple perilla will produce a sweet and spicy taste, which is loved by both southerners and northerners of China, as well as compatriots from Hong Kong and Macao and foreigners. Rice noodles originated from Shahe Town in Guangzhou, hence the name Shahe rice noodles. Rice noodles can be boiled, steamed or fried, with sour, sweet, bitter, spicy and salty tastes. Shahe Restaurant enjoys the highest reputation of serving best rice noodles. Chashao bun, an old-brand famous snack of Guangdong, soft, sweet and fragrant, are served by all large and small restaurants in Guangdong all the year round. In the past men of letters and tourists loved to take a boat tour in the western suburbs of Guangzhou when night tell in summer. Small boats carrying porridge served scholars and tourists taking a boat tour. Later many local restaurants began to prepare such porridge too. Now people can taste Tingzai porridge everywhere in Guangzhou. even in high-elms hotels. Steamed rice flour tolls are as white as snow, as thin as paper, aromatic, smooth and tasty. With snacks of Lingnan region (Guangdong and Guangxi) as the basis, Guangdong has extensively absorbed the technique of making cakes from north China, including imperial snacks of the six ancient capitals as well as Western cakes. Guangdong Province has all kinds of refreshments, which are prepared with a wide variety of materials and ingredients, all the year round to meet the needs of different people. Guangzhou-style moon cakes are one of the best choices for the Chinese people when celebrating the Mid Autumn Festival. Sweet or salty, Guangzhou-style moon cakes are golden yellow in color, beautifully shaped and soft, with thin skin and clear and delicate patterns. They are easy to carry about. The stuffing includes lotus seeds, apricot kernels, mung beans, sesame seeds, mushrooms, dried shrimps, etc. Dumpling with fresh shrimp stuffing was created by a small restaurant in Wucun Village, Wufeng Township in Henan District, Guangzhou. 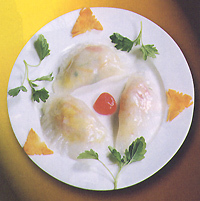 After many years improvement, such dumplings have become very famous and have remained in great demand for a long time. 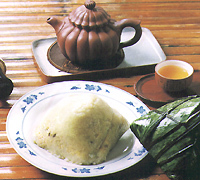 In the past rice wrapped by lotus leaf prepared by Taiping Town, Dongguan was the most famous, featuring a light, refreshing and delicious taste and a faint scent of lotus leaves. Now almost all restaurants in Guangzhou serve such snack. 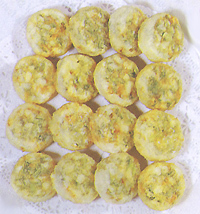 Turnip cakes which are fried in light oil are loved by Guangzhou people. Wanzai turnip cakes can be eaten without being fried.